Police continuing search for Arab terrorist behind Rahat stabbing attack in which 65-year-old Shlomit Gonen was injured. 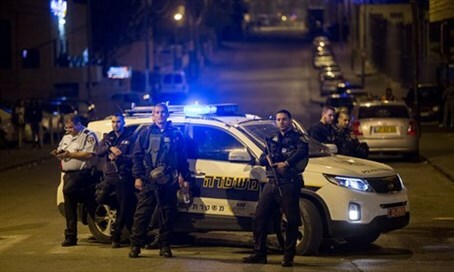 Dozens of Southern District police officers are continuing the manhunt on Sunday for the Arab terrorist who attacked an Israeli woman in the Bedouin town of Rahat yesterday afternoon. The terrorist stabbed 65-year-old Shlomit Gonen in the neck as she shopped in the city's market, before managing to flee the scene. Police have acquired photographs of the attack showing the direction in which the 20-year-old stabber fled. According to eyewitness accounts, he was masked. Checkpoints remain in place at all the entrances to Rahat as well as in several surrounding towns and villages. Rahat Mayor Talal al-Karinawi has also called on residents to assist police. "We ask security forces to catch the terrorist and bring him to justice," said al-Karinawi. "In addition, I appeal to all residents, anyone who knows anything about him, anyone who heard something about him - pass it on to the police." Gonen was moderately injured in the stabbing but her condition has since improved. According to reports Sunday morning, the Mishmar Henegev resident is likely to be released today from Soroka Medical Center in Be'er Sheva. Describing the attack to reporters on Saturday night, Gonen said, "I was planning to go into the store and felt a flick on my ear. I started hearing a ringing in my ears; I fell down and got up." "My son-in-law told me that I was bleeding and began to apply pressure to my neck," she recounted. Gonen's son-in-law Benny told reporters, "We went to Rahat to buy a phone case and we began to hear shouts and I saw that she fell over. I saw her lying on the floor and I put my hand on her neck to stop the bleeding."